One way to shoot closeups is to, well, get closer to the subject. If you look at a normal helical focus lens you will notice that it is at it’s shortest when focussed at infinity and most extended when focussed at it’s minimum focus distance. 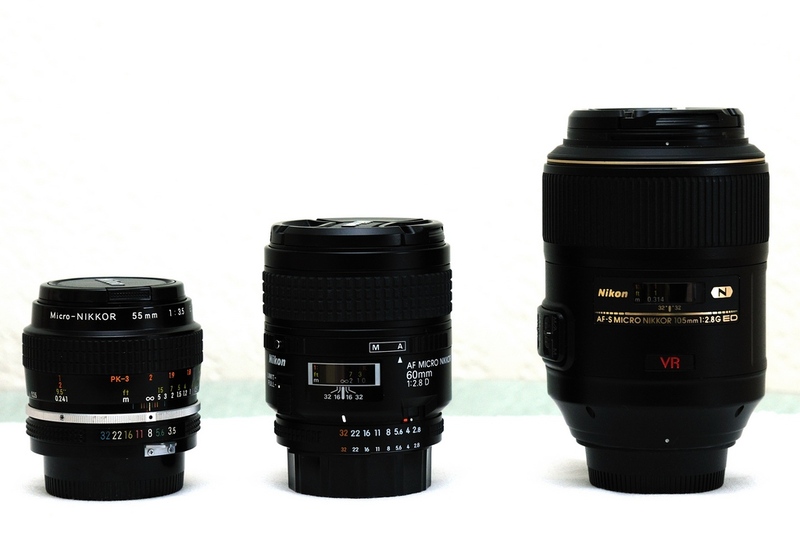 These picures show the 55mm f3.5 Micro-Nikkor, the 60mm f2.8D Micro-Nikkor and the 105mm f2.8 VR Micro-Nikkor. In the picture on the left, they are set to the infinity focus mark. In the picture on the right, they are set at their minimum focus distance. Notice that the 55mm and 60mm are longer at the closest focus point while the 105mm has not changed it’s length at all. That is because the 105mm is an Internal Focus lens. It’s front element does not move relative to the camera or subject while focussing. A problem arises when you reach the minimum focus distance for your lens and you are still not at the desired magnification. It no longer focusses because it can’t extend any more toward the subject. Two types of accessories can help with that. Extension Tubes and Bellows. As the name implies, Extension Tubes are simply hollow tubes which fit between the lens and body and extend the focus range. Well, it doesn’t really extend the range, it just shifts to a closer range as infinity focus is lost when extension tubes are used. Extension tubes sound pretty simple, after all, they’re just an empty tube between the lens and camera. They do need to be well constructed though. That means that the ends of the tube must be parallel to each other or else, the lens will be out of alignment. This misalignment will show itself quickly in use. 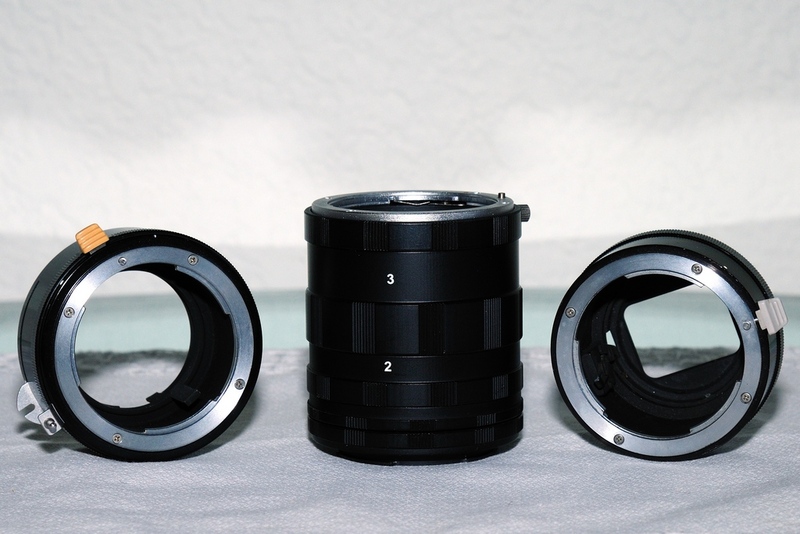 They also have to be sturdy enough to hold the weight of the lens without bending or, the alignment is lost again. These pictures show the Nikon PK-3 on the left, a cheap plastic set and the Nikon M2 on the right. The cheap plastic tubes you see advertised for a few dollars are not worth the risk. I bought a set to use for a demonstration at a macro workshop I was giving for my local camera club. They did not fit together well and after use, the lens mount release pin would not operate to release the tubes from the lens. If you look at the picture on the left you will see that while the lens mount is metal it is held to the plastic tubes with small screws into a thin flange. the camera mount is all plastic. The three tubes are all plastic with all plastic threads. You might want to consider build quality on the $10.00 tube set before mounting them between an $1800 camera and a $900 lens. You may learn, to your dismay, that cheap tools can be really expensive. You wouldn’t think that an empty tube would have any optical properties but, while taking these pictures, the ‘anti’ reflection ribs in the plastic tubes showed that it actually reflects light inside the tube. Why not, it’s just shiny plastic. 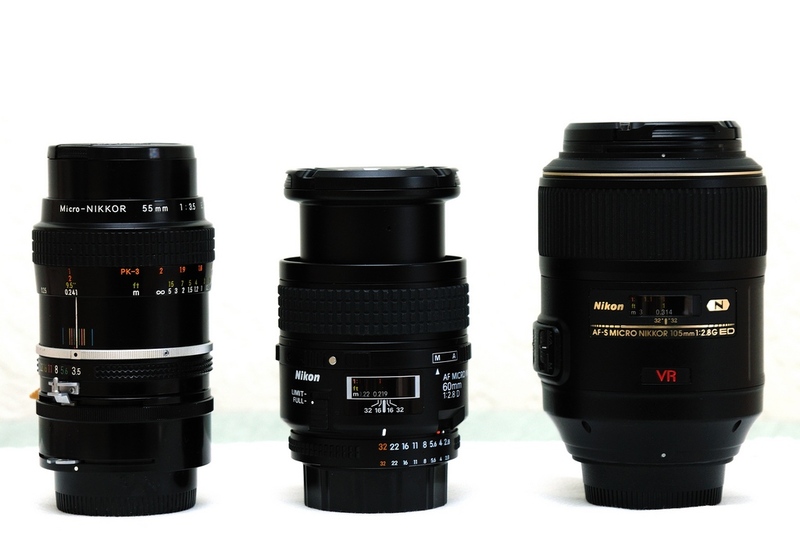 The Nikon PK-3 and M2 rings were actually sold independently or with the old 55mm f3.5 Micro-Nikkor. The original lens did not go to the full 1:1 magnification ratio and the extension tube was used to provide that capability. Both are metal construction 27.5mm extensions. If you look at them, they are marvels of engineering compared to the cheap tubes. Both have actual matt black interiors eliminating reflection and the M2 even has a metal masking frame at the rear to really eliminate stray light. 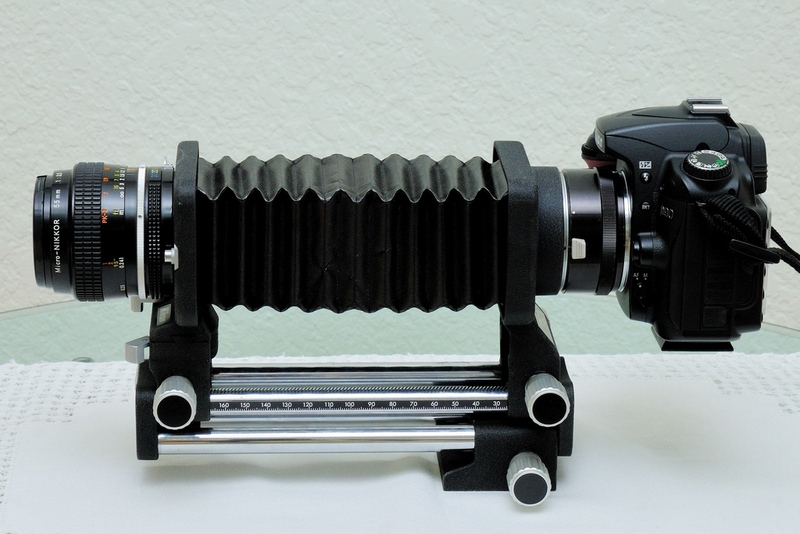 The primary difference is that the PK-3 includes the fork and aperture linkage for metering while the M2 does not. Bellows are like the extension tubes in that they allow the lens to be moved closer to the subject. They are different in that they are solid mounts for the lens and camera with a flexible, light tight bellows between them. The Nikon PB-4 bellows includes the ability for shifts and swings or tilts for better Depth of Field Control. On the left, you can see the PB-4 with the 55mm mounted and with a swing on the lens mount. the right picture shows the PB-4 at full extension with the 55mm and D90 mounted. 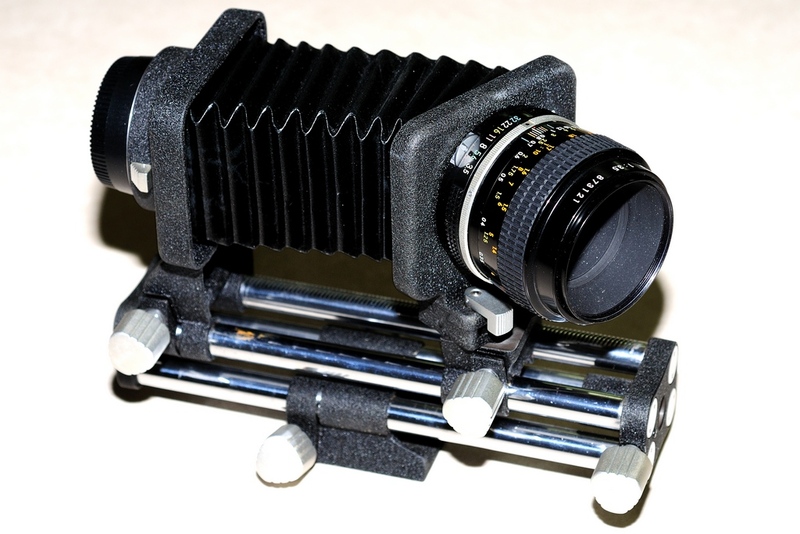 The modern camera bodies with a grip will need an extenstion tube between the camera and camera mount on the bellows. The grip will foul the bellows without the tube in place. In this case I am using the M2 tube. The PK-3 tube should not be used with modern Nikon cameras since it is not an AI mount. Unfortunately, neither the bellows or the extension tubes above will work well with G mount Nikkors. The G mount lenses do not provide for any sort of mechanical aperture control when mounted normally on a tube. Reversed, you can control the aperture to be wide open to focus. The Nikon rings will open the aperture but, there is no fine control. When the picture is taken it will always be at minimum aperture. While in camera metering systems accomodate the exposure problems of long extensions, you should be aware of it. I discussed this in more detail as Bellows Extension Factor in the Terminology post. You should be aware that the viewfinder will be very dim when focussing.